During one week of school, half the students were put to bed earlier than normal, averaging about 27 minutes more sleep a night. The other half stayed up later than their routine bedtime, losing about 54 minutes of shut-eye each evening. Teachers - who didn't know the sleep status of the students - reported significant differences in how the children behaved and coped with everyday challenges. 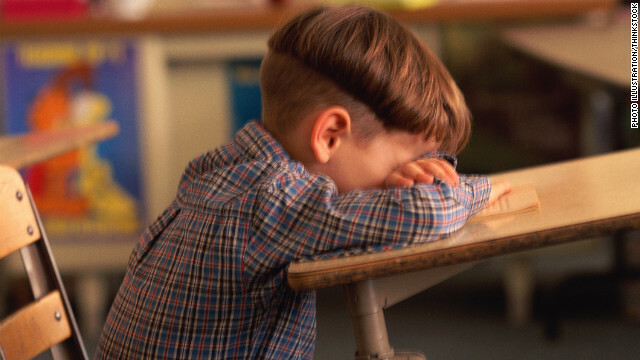 Students who were sleep-deprived not only seemed overly tired, but were more impulsive and irritable than their well-rested classmates. They were quick to cry, lose their tempers or get frustrated. The children who got plenty of sleep had a better handle on their emotions and were more alert in class. Sleep experts say these results make sense and provide more evidence about the importance of sleep. "We know that sleep deprivation can affect memory, creativity, verbal creativity and even things like judgment and motivation and being (engaged) in the classroom," explains Dr. Judith Owens, director of sleep medicine at Children's National Medical Center in Washington. "When you're sleepy, (being engaged) isn't going to happen." And when children have trouble coping with day-to-day situations, Owens adds, this can affect a child's relationship with teachers, as well as their success in school, social skills and the ability to get along with peers. So how do you know if your child is getting enough sleep? Children in elementary school generally need between 10 to 11 hours each evening, but no two children are alike. Parents should look for clues, experts say. "Kids in this age range should not be sleepy during the day," Owens says. "If the are falling asleep in the car or watching TV, that's a red flag." Another way to gauge your child's sleep need is to pay attention to how much they sleep during school vacations, when they're sleeping without a time schedule. If they consistently sleep longer than on school nights, your child probably isn't getting enough sleep. Parents can take steps to get their children off to bed at a reasonable hour. "Consider that (sleep) is one of the building blocks of your child's health, well-being and academic success," Owens says. "It's equivalent to good nutrition, exercise and all the other things we try to foster and provide for our children. You've got to put sleep right up there at the top of the list." Too bad they weren't Canadian, too. This wasn't an American study. yOUR POST IS VERY NICE. THE INFORMATION YOU MENTIONED IS VERY GOOD. KEEP POSTING. Duh, ask any elementary school teacher and they'll tell you the same. Lack of sleep leads to a host of problems. As a former teacher, it's amazing to me how many parents will not make the effort to mitigate harmful habits at home. For one reason or another (all bad excuses), many fail to implement professional recommendations to help their children at home, only to rely solely upon the schools to test for learning disabilities. There's a long wait for these tests, people. In the meantime, doesn't it make sense for parents to do all that they can to provide the best environment for their child? I've even seen parents, on a regular basis, turn down free eye examinations and glasses for their children because their kids (or the parents) don't like glasses! I have been at schools where a chartered bus will take the child to the eye doctor with a school chaperone and the parents decline the service! I have encountered school nurses who have even offered to pay the $20 for glasses on behalf of parents who don't qualify for free glasses, only to have the parents decline. Meanwhile, these poor kids are sitting in the classroom, unable to see properly or falling asleep because their eyes are tired. Of course they goof off. And then do you know what happens? They get labeled for evaluation for learning disabilities when sometimes all they need are the darn glasses! A lot of time (and yes money) is spent on cases like these because teachers and schools can not force parents to ensure that their children have glasses and wear them! It really gets on my nerves because children with actual learning disabilities that don't have such a simple fix are forced to wait in line under the huge caseloads that many schools (especially in the inner city) have. So come on, people, make sure your kids get enough sleep and by God, if your kids need glasses, then by all means make sure they have them and wear them (especially if they are provided to you for free! )Oh, the stupidity. With all due respect, I don't think you give the parents enough credit. Today, most Americans are barely able to hold their frenzied, hand-to-mouth existence created by Wall Street and Corporate America together. By the time their kids are thirteen and hooked on Silicon Valley's violent video games, the parents shift their focus onto keeping their jobs and houses, not making sure their darling children get enough shut-eye. I'd be willing to bet that inadequate sleep is a major factor behind many ADD/ADHD diagnoses. I'm appalled at how little sleep some of my kids' friends get each night. Absolutely. It is astonishing how little parents know about children's sleep requirements. Kids respond to sleep deprivation with adrenaline–makes them hyper. Remember all the little kids at the Batman midnight showing?! Not only was the content inappropriate, but so was the time. Lack of sleep plays a big role in obesity, too–for both kids and adults. Humans are so sensitive to light-dark cues, too–not going outside to play during the day impacts that. And sitting in front of screen late in the evening makes it harder to fall asleep because of all the light entering the eyes. ADHD is largely a BS diagnosis. The kids I have seen that allegedly have it eat a crappy diet and are sleep deprived. It's easier for the parents to just give them a pill than to actually parent their child. Sad, but true. It's easy to say that there is no real ADHD, just kids with bad parents who don't make them sleep, but that's wrong. Kids with ADHD have trouble sleeping BECAUSE they have ADHD. I have two kids, one with and one without, and there is simply no comparison. Same parenting, but one kid gets sleepy and falls asleep easily. The other ... doesn't, and never did, from babyhood on. Sadly, more advise for parents who aren't raising their kids to begin with. How do you know who is raising kids. I actually have 2 young kids. They have been on a regular sleep schedule since infancy, never have caffeine and eat a nutritious (not strict, at ALL) diet. Plus little to no television or video games. They play outside weather permitting and are tired at the end of the day so no problem sleeping. It's not rocket science. I cope better when I sleep at work. The problem is that we have too many C and D -students from D and F schools teaching our children. If I were a child and forced to learn under such obvious morons, I'd act out as well. Perhaps if teachers would actually teach in school instead of sending the children home even more confused but with tons of homework, kids could get some sleep. II suppose it's hard to be a good sleep role model for your kid when you're one of the lazy 47% in this country that can't get good sleep because you're working two dead-end jobs. Lack of sleep effects adults the same way it effects children. adults dose off on the wheel? Chance of tragic death and accidents. @ Paulronco , When Romney spoke of the 47% thinking of themselves as victims, he must have been thinking of you at the time. How much money did we spend for this epiphany? Could we focus on something worthwhile? Any parent could have told them this; actually, anyone with a functioning brain could have given the researchers the same conclusion. What a bloody waste! This is the sort of ephemeral nonsense that gives science a bad name. Seriously. Have you ever tried to FORCE a kid to go to bed? I know my 9 year old doesn't get enough sleep. She never acts out in class and learns what she needs to at school, but you can tell she's tired. But when bedtime comes around, she does not sleep. We've tried putting her to bed early even. She doesn't get games, or dolls or anything to play with in the bedroom, but 9 times out of 10 she'll be up at 11pm till past midnight entertaining herself with stories in her mind and acting them out with her fingers, like she was wearing finger puppets. She even changes her voice to match her little characters. Sometimes it just doesn't work. Each person is built differently and have their own internal clock. If I could find a job that would let me work overnight, I'd be in heaven, because like my daughter, I've always been awake late. I can't sleep early, my brain refuses to shut down. However, unlike my daughter, the littlest noise wakes me up when I'm sleeping. Once she goes down, she's down until her alarm sounds, not even her baby sister screaming can wake that girl up. Yes indeed, I am a elementary school teacher and mother, and as the years go by, I have noticed that children are restless, not interested in working, and very talkative. I do agree with what this article says about children needing to rest more. Believe me, the parents are forgetting basic habits for kids. Please parents read it carefully. We must follow simple rules as having children sleep their hours. Check what kind of food are they eating before going to bed, because this could be the reason why your child does not want to go to bed. Dear Editor, I disagree with this article "Kids who sleep more cope better" because I believe it's all about the kids knowledge than how much sleep they get. I disagree with this article because I'm one of those kids who don't get enough sleep. As you said kids who don't get enough sleep tent to get frustrated, lose their temper, and sleep during the day. I believe it depends on the kid because like i said I'm one of those kids don't get enough sleep but during school or out of school I don't get frustrated, lose my temper, or sleep during the day. My friends would say this is true because I'm with them all day and they would say I don't do the things you listed on your article. I don't do these things because I keep myself active, eat right, and I also catch up on my sleep during the weekend. Most kids who stay up late are studying for tests or is doing a project on a certain subject in school. These kids who stay up late to study or finish a project tent to do better on tests and projects than kids who go to sleep early and don't study or finish a project. I say this because some of my friends are like this and the ones who study and finish their project get good grades as in the other hand the other half get good grades but not as high as the ones who studied or complete all the project. At the end this is why I disagree with this article. It has to do with the kids and what they do for staying up late. I believe it has to do with the kids knowledge the kids have rather of how much sleep they get. HEHEHEHEHEHEHE I am A from pretty little liers!!!!! I homeschool my 5y son. One reason is to protect his sleep. About once a week he will sleep 12-13hrs a night. After reading some sleep studies on children, I know his brain needs that time to grow and process information. Exreme? Awesome publish, definitely regret not likely into the USO style dinner. Keep up the good get the job done! I only get about 6 hours of sleep during the week. Between all of the extra- curricular activities and normal school work, I am constantly busy. I am also a straight A student and a good kid. I am also ranked number 3 in my class. I am about to loose my mind, but I don't really care. That was a really simple question asked by my mom that I had no idea how to answer. I brought up these very topics to my professor last week and she could not offer a rebuttal. I just randomly discovered your posts. Using your advice has seriously increased my street credit. Tell me if I might be helpful to you. I've almost no doubt that it is extremely hard to use this stuff in the real world.